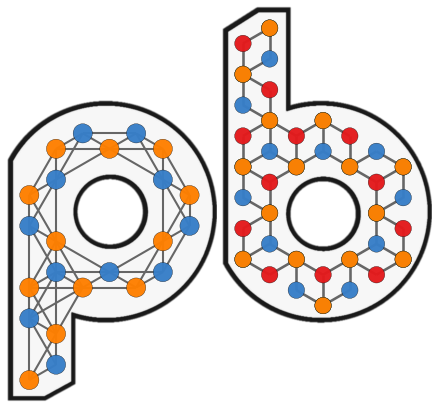 Pybinding is a scientific Python package for numerical tight-binding calculations in solid state physics. If you’re just browsing, the Tutorial section is a good place to start. It gives a good overview of the most important features with lots of code examples. Within the pybinding framework, tight-binding models are assembled from logical parts which can be mixed and matched in various ways. 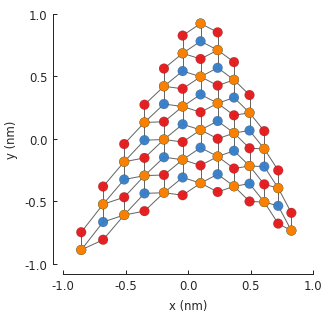 The package comes with a few predefined components: crystal lattices, shapes, symmetries, defects, fields and more (like the graphene.bilayer() lattice and the regular_polygon() shape shown above). Users can also define new components (just like the asymmetric strain above). This modular approach enables the construction of arbitrary tight-binding models with clear, easy-to-use code. Various solvers, computation routines and visualization tools are also part of the package. See the Tutorial for a walkthrough of the features. The source code repository is located on Github where you can also post any questions, comments or issues that you might have.